This is a true blog with images, descriptions and comments. It compliments my online gallery http://www.ronunruhgallery.webs.com. It describes creative process and the finished product on someone's wall. Murray's affirmation was what I needed. Murray walked through my home, room by room, pausing for a few minutes at each of my watercolours, oils and acrylics. When he concluded his tour of my paintings he asked me, "So what do you want from me?" I told him I wanted his opinion about my art and whether it had merit. He said, "First, let me assure you that you are an artist." That alone made my day. It was 2008 and I was 66 years old. My life was changing. I had invited Murray to my home because I was concluding a forty-year career quite unrelated to painting. I was requesting advice from a successful artist who was a man of integrity. As a youth my heart was set on an artistic career but at age 18, I set aside my application to Ontario College of Art when I felt strongly impressed to train for a career as a pastor. Through the years I continued painting as a hobbyist. In 2008, after four decades of local church and denominational leadership, I was retiring. Murray understood me. He had been in the ecclesiastical world. Murray's comments that day encouraged me to pick up my brushes again and begin a new chapter of creativity. He told me, "You're a true watercolourist. I can see that. If you want to work in one of the other mediums, I recommend oils because they will best compliment your abilities." I retired and was released to paint with a passion. I held my first solo art show in 2009 in my own home with four large rooms filled with paintings on easels and walls. Murray and Betty were among the patrons, and Murray purchased a watercolour called 'My Place.'. This past Thursday at noon, March 1, 2018, Murray Earl Phillips passed away in Langley, British Columbia. He was born on June 10, 1944. He was diagnosed six months ago with a brain tumour. A Memorial Service will be held on Wednesday, March 7, 2:00 PM at White Rock Baptist Church. This will be the longest post I’ve ever written, but it is worthwhile reading. Remember Murray. So many friends knew Murray more intimately than I did. I was an acquaintance at best. Yet when we were together, he made me feel like a lifetime amigo. Mutual respect, common passions, shared faith and affinities effect relationship. What was his story? Many of you know the story and for others, I will understand your fascination with the complexity of factors in Murray's family, education, interests, careers and skills that made him a humble, grateful, rounded, sensitive, articulate, enterprising, astute, people person and artist. He volunteered a great deal of personal information for websites, galleries and interviews. While academia was Murray's early world, with graduate degrees in both Theology and Cultural Anthropology, and teaching in colleges and universities for twenty years, Murray developed a deep passion for the wilderness with a heart for the Creator and the eye of an artist. He often expressed it this way, “There is in my soul an intense urgency to paint, as if something terribly important needs to be communicated, and I can only say it with brush and canvas. Sometimes the soul’s only instruments are brush, canvas, and paint.” Somehow he also created time for other interests such as sailing, canoeing, and classical guitar. Owner of an art gallery and framing store in Langley for many years, Murray was a familiar figure to the community of artists and patrons. His own paintings drew a following of collectors and as the sales of originals and reproductions increased he eventually sold the store. He was a prominent artist at the Calgary Stampede which is a stellar display of gifted artists and remarkable art. Murray was member of Artists for Conservation (AFC) and a Board member (2014-2017). He and his wife Evelyn were vigorous supporters of AFC activities for years and Murray brought his numerous skills to his commitment to AFC. In one bio piece on Nature Artists website, he explained his philosophy of painting the wilderness. "We isolate ourselves in layers of protection from the wildness. Even our camping is hardly a foray into wildness. It has a certain safety and sterility to it. We pack our belongings into our trailers and head to the country for the weekend to set up temporary residences along with other urbanites in the great outdoors. Tents and trailers hastily assemble on Friday evening and set up temporary nomadic villages that disassemble Sunday and move back to the city. Wildness is rarely unseen and largely unknown - it remains a stranger and therefore frequently frightening. Yet, it is reflective of our soul’s craving that is so essential to our being. For many, wilderness has become artificial and the city is reality - wildness is abandoned for the false security of the cloistered neighbourhood. "For me as I grow older the urban world is increasingly foreign. I find it necessary to imbibe regularly from the wildness in our world. I am not immune to creature comforts but I need to move beyond that at times and experience the wildness that is still there. We do not often go into the wilderness to find the wildness - we go onto the wilderness. The wilderness becomes our playing field in which we engage in our “extreme” sports. We tear over our lakes in high-powered thundering boats or seadoos. Snowmobiles try to outdo one another in speed and telemarking. We “conquer” mountains by climbing them. But, the wildness remains unseen and unnoticed. The wildness is subtle and secretive revealing her beauty to the patient and determined suitor. Wildness is the soul of the wilderness - it is not a place as much as an experience. It is the art and spirit that is frequently found in the most elusive and isolated places. It most often comes to us when we are quiet and alone in an unexpected time. It withdraws from noise, clamour, and busyness. "We live in a time when people are increasingly nervous about quietness. We are bombarded with messages and the media every day. We have been seduced by noise and clamour. We want to be endlessly entertained. In his excellent book Last Child in the Woods Richard Louv writes about a commercial on television which advertises the advantage of a particular model of Minivan in which children are entertained in the back seat by videos that can be seen on the back of the front headrest. The commercial shows these children immersed in the viewing of this video while driving through spectacular mountain scenery that they never observe. We are so enamoured with the media that we do not see the beauty around us. "My father was a minister and his last parish was in the heart of the inner city in downtown Brooklyn, New York. His church was in the ghetto with the Black Community on one side of the church and the Puerto Rican Community on the other. In the summer he operated a day camp that took children from the ghetto out to the country. They were in shock; it was a world they never had seen in reality. Some children saw their first tree. The ghetto where they lived did not have trees and they never strayed far from home. The risk was too high. "I was walking one day with some children in a park near my home and I suggested that we see how many different birds we could identify on the trail. No sooner had I said that than a robin landed on the path in front of me. I said, “Look, there’s a robin”. A ten year old said, “What is a robin?” I was surprised that even something as common as a robin was unknown. What is happening here is significant. I do not think the initial threat to our wilderness is overhunting or pollution. We lose it first from neglect and lack of knowledge. With no naming of what is there and no knowledge we simply do not show up - we forfeit our stewardship. "Naming is an important process. In ancient writings, naming was the first task given to people. It is still the first task. When my father was a child being raised in southern Ontario his mother told him not to name the farm animals because, she said, it made it hard to eat supper. Sounds funny, but it is true. If you name the young calf or the chickens you change the nature of your relationship and when it came time to butcher the animal it was more difficult. We need to start again to name and to identify what is there; in that process we change the nature of our relationship. "So it is with my painting. I view my art as a language, an effort to translate my experience in the wilderness. It is an attempt to communicate wildness in its many forms; to narrate my encounter with wildness. I am trying to seduce you into experiencing the wilderness. It is a story. But I only get to tell half the story, I never write the conclusion. That is up to you. When you observe the painting and say: “That reminds me of the time....”, you pick up the story and carry it on. I spend approximately 4 months of every year in the wilderness, sometimes in isolated places. I live there and paint there. These are not “plein aire” paintings done in one sitting. They are often large canvases (24” x 36”) done on location over several weeks. I try to catch the elusive wildness of the place. I try to communicate to you the beauty and secretive quality of wildness. Sometimes, every once in a while, I get glimpses of something so precious, fleeting, and wild that I am moved to tears. It seems as if I am walking on the still wet paints of a Master Artist so far beyond me in ability and resources. I stand in silent awe and adoration. It is a humbling experience. I am left with my paints and my brush to tell you what happened. That is why I paint. In recent years Murray participated with other artists in protesting the proposed pipeline and the risk of super tankers up and down narrow channels. In a book entitled 'Canada's Raincoast at Risk,' their artwork portrayed the magnificence of the British Columbia Raincoast as they advocated for an Oil Free Coast. A couple of my own personal reflections of Murray follow. Murray's mother passed away in September 2009 and I received a call from Murray. He was not connected right then with any specific church congregation and he told me, "I find myself in need of a pastor." He didn't need an officiant for his mother's service. He himself was going officiate that and he was easily capable. He needed someone to shepherd him through the grief of losing someone so integral to his life. Christine and I gladly visited Betty and Murray one afternoon, and we chatted about the promises of God as I read scripture to them and prayed with them. Murray was always a kind encourager and motivator. He and his wife Betty lived in a spacious home in Murrayville that Murray purchased with a view to holding large gatherings and events. 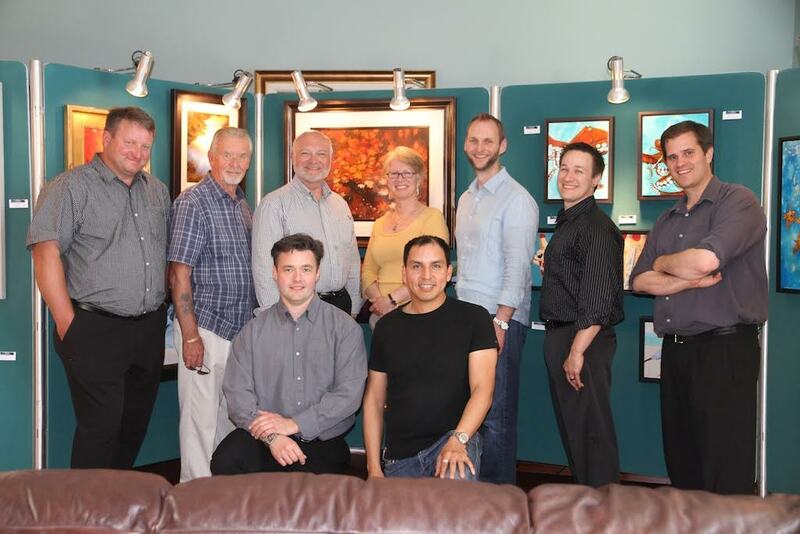 I was delighted in June 2010 to be included among a group of nine artists whom Murray called 'Emergence, a New Collaboration of Visual Artists'. The other eight were Carmel Clare, Robert Heinrichs, Bernie Major, Scott Gordon, Kevin Hastings, David Ediger, James Phillips, and George Jersak. We all displayed and sold art in his home over a weekend. None of us know what tomorrow brings. As I lived my life I would often read with admiration about Murray's latest accomplishments, travels, and successes. Always Betty was in support of his ambitions and the painting lifestyle he chose for his artistic career and marketing. He was gone for periods of time into the wild country, the bush and the mountains that became the subjects of his paintings. And then shockingly Betty was ill, very ill. She received treatment and carried on and then her health began to fail. She died in June 2013. Murray and I connected occasionally, and via email he kept me informed. We were away and missed her memorial. Murray kindly sent me the following. "Thanks for the note Ron - it has been a difficult time to say the least. I will include some of the program that might outline more of the details. Take care, Murray." He then attached this obituary, penned by him, like no other. "Betty was born on a farm northwest of Acme, Alberta on March 23, 1943 with the first teasings of Spring. Her parents were Martha Ratzlaff, a wonderful cook and gracious hostess and her father Richard Ratzlaff, a truck driver/farmer. She had three older brothers: Harold, Eric and George and an older sister who died prior to Betty’s arrival on the scene. Betty loved the farm and often spoke fondly of her experiences there. We went back several years ago and visited the old homestead and the nearby cemetery where Edith Leona is buried. However life on the farm was difficult in those days and one too many hailstorms forced a move west to Abbotsford where a new home on Emerson was constructed which exactly one year and a day later was burned to the ground. As a result there are few pictures of Betty’s childhood since the contents of the house were destroyed. The family then moved to 59th Street East in Vancouver and Betty attended John Oliver High School. She was an eager and bright student. Having skipped a grade earlier in elementary school she enrolled at UBC when only 17 years old. At University she majored in mathematics and psychology. She wanted to be a teacher and began to teach at age 20 in Vancouver. Two years later she resigned and enrolled at the Mennonite College in Winnipeg pursuing a Bachelor of Religious Studies degree. While in her second semester there she met a transfer student who had just arrived from Toronto - Murray Phillips. One evening after supper, four students including Betty and myself were involved in a crokinole game in the student lounge. The competition was intense and after many rounds the score was deadlocked. The decision was made to declare a winner after the next round. Betty had the last shot and could have won the game but uncharacteristically missed and lost the round. Later that evening I wrote a 7-page poem to Betty entitled “Ode to the Last Shot”. Betty responded with an equally impressive poem and a romance began. Sixteen months later on June 23rd, just a few weeks after her Father’s untimely death we were married at Fraserview Mennonite Brethren Church in Vancouver with my father officiating. The next few years involved more studies. Betty finished with three degrees: Bachelor of Arts, Bachelor of Education and Bachelor of Religious Studies. We were then called to serve a church in Kenora, Ontario that proved to be some of our fondest memories. While here, Christine and James were born, and welcomed into our mobile home on the church property. Friendships were formed that have lasted a lifetime. However, the conservative and somewhat ossified structure of the church was an ill fit to reach out to the transient hippies and counter culture so prevalent in that area. 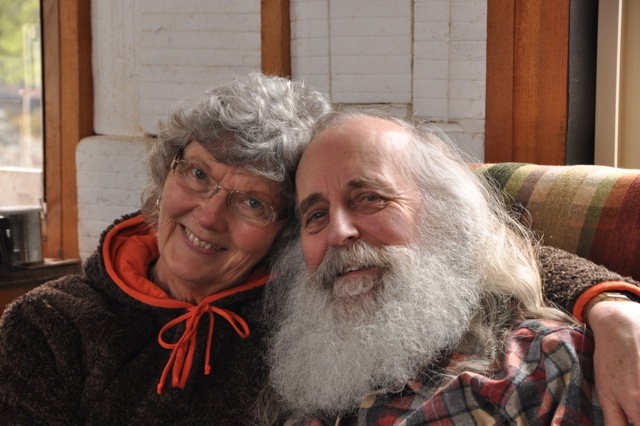 So Betty and I bought a 60-acre farm and opened a community called Second Mile Christian Community. Though rustic in style and accommodation this proved to be one of the most significant ministries in which we were involved. Dear friends, Ken and Mona Merritt, joined us in that work. It operated as a summer study community for 10 years and over that period attracted over 1600 people - some of those people are here today. The next years involved a variety of moves and experiences: First to Saskatoon, then Caronport, Saskatchewan where both of us taught at Briercrest - Betty in the elementary school and I at the College. We then moved to Abbotsford for approximately 20 years. This is where our third child, Jonathan, was born. Betty loved mothering and was always attentive and there for the children. Some of our richest memories involved our summer long sailing trips. We cruised the Gulf Islands and spent many evening tucked in a quiet anchorage talking, singing or reading books. Once they were all in school, Betty launched a new career and opened a very successful bookstore - Logos Bookstore that she operated for 4 years and then sold it. Shortly thereafter, Betty had her first bout of cancer in 1984 - breast cancer. Both of us were involved in teaching - Betty started back to teaching in Mt. Lehman - a school and district that she dearly loved. The years following her cancer were difficult for us and we struggled much to keep our lives together. However, both of us were determined to go on together and we were deeply rewarded. Betty demonstrated wonderful skill as a mother. She was so supportive and attended as many concerts, sports events and events as she could. To say she was attentive is an understatement. She was always there for them and supported in whatever way she could. Some of the happiest days of her life were times of celebrating the accomplishments and passages of her children. We chose new areas of involvement. Betty went back to UBC and finished her Masters degree in counselling and I dropped out of the Ph.D. program at SFU. I was close to completion, but it was the right decision. With Betty’s support and encouragement I opened an art gallery and we moved to Langley. We re-invented our lives and the rewards were wonderful. Betty’s counselling and relational skills were deeply appreciated and she loved her work and found profound meaning in relating to “little people”. I actively pursued a career as an artist. We experienced such rich years. It was hard work for both of us but we loved it and grew in our love for each other. 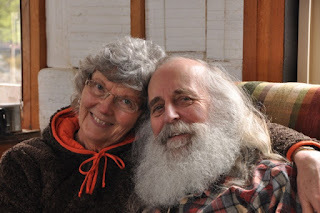 Just a few months ago, one evening Betty talked of our life journey and said, “I have not seen anyone as close as we have become.” That meant much to me. Betty retired when she was 64. She wanted to spend more time with the grandchildren and so she did. I was frequently on the road doing shows and when she was not with me she spent wonderful hours with the grandchildren - it was her “calling” as she would say. She was such a wise, quiet and thoughtful person who had an enormous ability and skill to connect with children. She loved them all dearly and during the last week of her life she dictated individual letters to them all. I believe that the influence of life will always be seen in their lives. Betty’s health was not good over the last few years. Two years ago while aboard our sailboat in the Gulf Islands she encountered heart problems and we had to cut our trip short and she spent much time in the hospital trying to deal with atrial fibrillation - finally having a Navex Ablation procedure at St Paul’s Hospital. Then last Fall the same heart specialist sent her to a liver specialist Dr. Yoshida at Vancouver General Hospital because he was concerned that her heart medication had damaged her liver. Sadly a worse scenario emerged and we found out Betty had cancer of the Bile Duct. After several anxious weeks surgery to remove the cancer was done by Dr. Scudamore whose skill is legendary. The pathology report was good and we began to have hope again though the general prognosis for individuals with this type of cancer is not good. In March, we decided as a family to have a special celebration on Betty’s 70th birthday. It was wonderful with over 100 people in attendance. We said to her many of the same things we are saying today and she got to hear it. She spoke about that every day to the end - it meant much to her. Late in April we were back at VGH, there was evidence things were not right. We got the news that the cancer had recurred. We anticipated that we still had months, maybe years left. Such was not the case. Betty’s health deteriorated very quickly, although she did not experience much pain. Our family sat in vigil around this one who had become the matriarch for our family. She was determined to live to see her youngest brother and his wife return from Europe on the May 29th. She also was determined to go to the Langley Fine Arts School graduation concert on May 29th to see three of her grandchildren perform. She made a valiant effort to go but once in the vehicle she said the pain was too much and we took her back into Hospice. She heard some of the concert the next day on an iPad. When we decided at the Langley Hospital that the Betty should go into Hospice they came to transport her across by vehicle to the Hospice that is not far away. I asked for permission to wheel her there instead so we could be in the fresh air. She thanked me for doing that and then said, “Murray, I need your help. I want to live my dying well.” And she did, she lived her dying well. Betty’s quiet faith in God and her active acceptance of her situation without anger or resentment was outstanding. She was the most loving and caring person I have met. She lived a life of service faithfully and courageously to the end. I have said for years she is the most outstanding person I have met. These are the words she gave to me and to our family just days before she died. "Many have been involved in helping us through these days. We are deeply grateful for the care of her doctors: At Vancouver General Hospital the medical staff led by Dr. Scudamore and Dr. Yoshida and in Langley, Dr. Hansen and Dr. Adamson; as well as the devoted and loving care of the staff at Langley Hospice whose personal attention and sensitivity were wonderful. Family and friends have encouraged us with their care. People from our faith community including Anne and Craig and Leah have been so caring. So many others have helped in one way or other. Every evening I had a bevy of calls from as far away as Montreal from people who wanted to support. My own children have rallied around and given ceaseless support and care. Our grandchildren have continued to inject themselves into our lives in precious ways. And our God has proven again His faithfulness. To all our gratitude. These are crippling days of grief but we will learn to walk again; albeit with a limp." "This was not the way we planned it. Betty, the strong and stable person; such an amazing ability to organize. Betty, the unflappable one. We had agreed and it seemed so obvious; I would die first. She was much more capable of carrying on. Such was not the case and our plans fall short of reality. We went into the Langley Hospital by ambulance exactly one month ago today. It was a Monday. We knew Betty’s cancer had recurred but we anticipated that we still had months - perhaps a year to live but it was a startling revelation to realize how serious her condition was - Betty was very septic and was at serious risk even then (she almost died that week). By Wednesday we were wisely encouraged to move into Hospice. It was on the trip across to Hospice that Betty quietly said to me, “Murray I need your help. I want to live my dying well.”. I was immediately struck by the calmness and honesty of her request. But I wondered, how does one do that? How do you live your dying well? Betty was about to give me one of her quiet but effective living lessons. What did I learn? I learned first, to be honest about where you are. I have been with an inordinate number of people as they have faced death I had heard many stories and saw many people live in denial and never learn the gift of cancer. This is often particularly true of some religious people who think any talk of dying shows a lack of faith in God. Yes, it was a gift to know she was dying and that we had time to talk and to share and to pray. Much better this than a sudden rendering. So, knowing that you have a few weeks to live, rearranges the agenda very quickly. The Vancouver Canucks and Stanley Cup playoffs are not important. The talking and sharing become very important. So, I asked what do you want to do? Betty said, I want to write letters to each of my children and grandchildren; a suggestion initially made by her son-in-law Martin. But we soon found out that Betty could no longer write. So we worked together. Betty was capable of making a list of items to include in the letter to each one. I wrote the letter but she dictated what she wanted and we talked about how to say that. Betty also asked me to buy Bibles for each of the children - a new translation that we had enjoyed ourselves and she and I worked on the wording for the fly leaf that is included at the end of the story of her life in the pamphlet. Next we hold hands under the covers and prayed - there are not many here who were not at one time or another in that prayer. Some every night like our children and grandchildren. She said we should keep doing that and we did every night. Then she planned. She planned this service. She told me to make sure you knew about it. She told me to welcome the children - the little people here. She told me how to use Bank Machines and do online banking. She told me to consider buying a Toyota. She reminded me that Wednesday night I should put out the garbage. She told me to thank you for your loving care to us. I asked her about death and specifically if she was afraid. I told her I was afraid. She said she was not afraid of death but she was sad to be leaving. I asked her about her faith. Any doubts? I asked. She smiled, then spoke very clearly and intensely, “Absolutely none.” I realized at that moment that I believed in the God of Betty Phillips - a God whose “love protects us from nothing but sustains us in everything”. As a friend once told us. I believe in a God who enables people to live a selfless life as did Betty. This cannot be reduced to good genetics or parenting. There are many religious gods that are part of our culture to which I am atheistic - even “Christian” concepts of god. But this God, that I had observed at work in her life, this God I believe in. I spoke about this at Betty’s birthday celebration. When Betty first found out she had cancer Barbara was there and I signaled for Barbara to come over and I told her that the initial diagnosis was cancer. Barbara reached out to Betty with caring support and kind helpful words. Betty’s response was to say, “And Barbara, how was your day?” I was stunned. Betty was not being evasive or in denial. She was what she always had been - a caring and loving person who put others first. Then she waited and hoped. She wanted to see her brother George and his wife Jenny who were in Europe before she died and she did. She also asked to visit with specific people that she wanted to talk with - she did that. Those were rich encounters. She wanted to go to the concert at Langley Fine Arts School that her grandchildren were in and she tried but it was too difficult. But she heard some of it the next day that had been videoed. Then at the end of all this she said her final words: “Let me go, I want to go up.” I stayed with her every night. We kept a vigil on this one I loved; who had so graced our life with her love, forgiveness and trust. And I want to live my days well - I want to live my dying well. She did it right. She showed us the way. She lived her dying well and so honoured the God she loved. Thank you for being part of this great adventure." Friends were thrilled to learn that friendship and companionship had become love and in 2015, Murray and Evelyn were married and it was wonderful for them both. Evelyn was so good for Murray. They shared life and interests and activities. They looked forward to many years together. This last year when I shared about my wife Christine's modest heart issues, he commiserated with reminders of Betty's similar experiences. He and Evelyn were doing well although he alluded to some health concerns of his own but nothing major. He said he was slowing down a great deal, even beginning to use the word 'retire.' They loved connecting with their children and grandchildren and were grateful for their church connection called Southpoint. In summer of 2017 they sold the spacious home in Murrayville. They had a garage sail to sell many furnishings and many paintings. 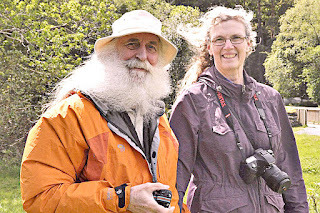 Murray told many of us that they would be spending time sailing their sailboat called 'Serenity' up and down the coast along with friends in two other boats, then they were heading out with a group of artists/friends on a cruise up near Bella Bella and Calvert Island. Following that, they hoped to go camping in our trailer during the Fall. Then suddenly came the grave diagnosis. With his wife Evelyn and Murray's children in mind, I am deeply saddened by Murray's passing. So many people will miss him. Ambition to be a graphic artist was displaced 50 years ago by a plan to study theology and to engage in altruistic service. Art became my pastime as visual images conceded to word pictures. I acquired Master’s and Doctoral degrees along the way. A career consisting of 34 years as a pastor and 6 years as a denominational executive concluded in ‘08. My faith and principles remain firm as I paint and write. I loved spending the day speaking with people who stopped to look at our art pieces. MX5 Air in my Hair - there's a story here. DOES LOVE OR BLOOD CLEANSE HUMANS FROM SIN? Click RON UNRUH ONLINE GALLERY to navigate to my new Gallery website. You will view paintings, some of which are available and others which are in private collections already. Click any image below to enlarge it. Ron Unruh. Ethereal theme. Powered by Blogger.